Well here we are! The last Where You Create in June! I hope once everyone gets into summer mode…a few more of you will snap some photos and share a bit about your creative spaces! Today we’ll be checking out Kathy Fast’s creative space…I know you’ll LOVE it! Hi there! I would really like to share my new space with you and other creative people! You just know when the before is looking awesome like this…the after will be great! I was struggling with my crafting space for several years. My husband had built me a wonderful “studio” desk but I outgrew it once my crafting migrated from personal scrapbooking to creating hand-painted signs. I found myself taking over the dining room table & kitchen island! Honestly! 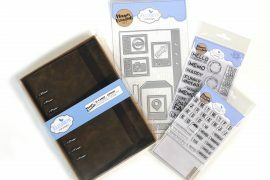 Every scrapbooker and crafters dream space…? Loving all the divided shelves for organizing! Everything has a place ? My husband graciously agreed that I needed a proper space of my own (or maybe he just got tired of my stuff taking over every room of the house!). I now have an absolutely beautiful 12’ x 12’ cabin just for my own! My cabin has all the space to be organized and inspired (the lovely blue colour on the walls is actually called “Awesome”)! I have room for everything I could possibly need: carts on wheels that hold my scrapbooking paper, pretty pink & grey bins that keep all my crafting neat, home-made racks that cleverly display all my acrylic paints, and deep cupboards to hold my wood and power tools. The custom sign s that Kathy makes look great hanging on her pegboard wall! So smart! I have a smaller table on wheels that I can store under my main workbench when I don’t need it. My dad is currently making me three guest stools so that I can have friends over for crafting parties! My cabin also has some true comforts of “home”. I have a kettle for tea, a coffee maker & a mini-fridge that holds water, pop & (ahem) wine. I also have a couch that converts to a bed should anyone need to spend the night! If I were Kathy’s guest I’d get no sleep! I’d be playing with all her supplies and drinking her wine! ? Thank you for letting me share my space with you. I am very proud of it & can’t wait to have friends over to share in my crafting fun. Thanks for stopping by! Be sure to leave a comment for Kathy below, we loved sharing her space! Love This CABIN! Lucky Girl you are! Beautiful space.. I guess you live in a mild climate.. to craft in the winter months! We live in Northern BC. My cabin is very well insulated and I have an electric ceramic heater that keeps my space nice & toasty. Aww! it’s wonderful! My scrap space looked much the same 8 years ago when it was new. Now I can’t find the walls! LOL The more space one gets the more goodies one gets also. How wonderful is this little shed! I am sure your hubby will regret it soon, as he will hardly see you in the house! Love!Love!Love!What a beautiful “She Shed”! Well done!